Of the Middle Dutch Arthurian romances the Roman van Walewein is considered to be the most interesting. It relates a higly original series of adventures undertaken by King Arthur’s nephew Walewein (Fr. Gauvain, Eng. Gawain). His initial quest for a wondrous floating chessboard can only be completed if Walewein undertakes a second quest (for the Sword with Two Rings) and even a third (the quest for King Assentijn’s beautiful daughter Ysabele). For King Wonder agrees to part from his chessboard only in exchange for the magic sword, and Walewein will aquire the sword only if he brings its owner, King Amoraen, princess Ysabele. In the end Walewein — with the help of the speaking fox Roges and the ghost of a dead robber knight — succeeds in bringing not only the chessboard to King Arthur’s court, but also his new love Ysabele. This ingeniously narrated romance of about 11,200 lines was, according to its epilogue, begun by Penninc, but not completed. The last 3,300 lines were composed by Pieter Vostaert, possibly around 1250. The Flemish authors shaped their story around the framework of a fairy tale (Aarne-Thompson 550), while creatively using many elements from the Arthurian narrative tradition. According to some scholars the Roman van Walewein could have functioned as an instruction in courtly manners for a Flemish aristocratic audience unknown with French Arthurian romances. However, a recent analysis of the Endi episode in relation with the chanson de geste argues that Walewein's and Ysabele's conduct concerning 'chevalerie' and 'amour' contradicts courtly ethics. Clearly, the last word about this fascinating romance has not yet been written. The complete text has survived in only one manuscript, which is written in 1350, according to the colophon (fol. 182r), and is now kept in Leiden University Library (ms. LTK 195). A single leaf with a full page-miniature (fol. 120v) has been inserted at the beginning. 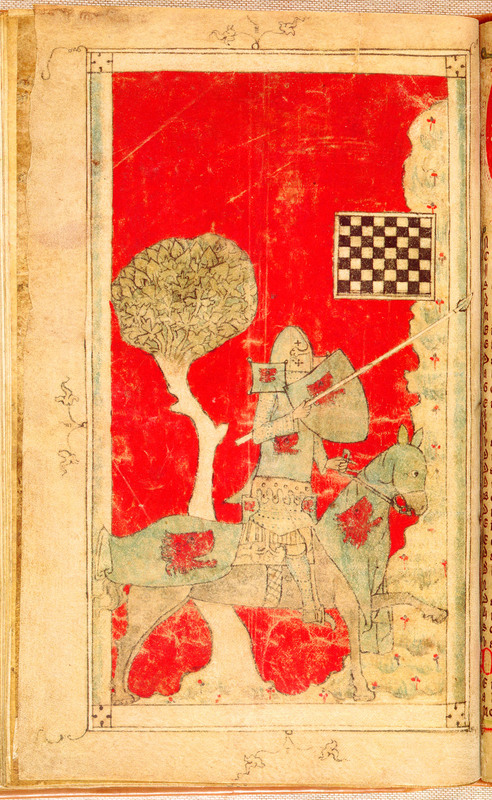 It shows Walewein on his horse Gringolet, in full pursuit of the chessboard, which is floating towards a mountain wall. The chessboard has 56 fields in stead of 64, possibly not the result of a drawing error but of an early effort to suggest perspective. Literature: Penninc and Pieter Vostaert, De jeeste van Walewein en het schaakbord. Ed. G.A. van Es, Zwolle 1957. — Penninc and Pieter Vostaert, Roman van Walewein. Ed. and transl. D.F. Johnson (New York/London 1992). — J.D. Janssens, ‘Schaken met de geest’, In: Ingenti spiritu. Hulde-album prof. dr. W.P.F. de Geest (Brussel, 1989), p. 110-130. — R. Zemel, 'Walewein en Ysabele in Endi', In: Nederlandse Letterkunde 15 (2010), p. 1-28.